Fungi is neither plant nor beast. However, this unusual organism possesses an uncanny ability to ward off danger to farmers and their crops via its intricate underground network system. While more closely related to the animal world, fungi are considered by geneticists and botanists as a separate kingdom that appeared to have diverged one billion years ago. 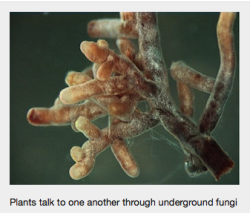 Underground fungus and surface plants have long been known to maintain a symbiotic relationship. Mycorrhial fungi delivers nutrients to plants, and in exchange the plants return the favor by supplying fungus with carbon, one of their's and nature's essential building blocks. Aphid, known to destroy cropsNow, a new study published in Ecology Letters indicates in addition to that trade-off, the mycorrhizal fungus network that connects many plants actually lets those plants defend themselves against enemies like aphids. The research focused on the chemical response many plants emit when under attack from these threats, which commonly feed on damaged plants. On the flip-side, plants, not connected to the fungal network did not mount these type of defenses. But based on fungi having a stake in keeping plants alive less they lose their carbon transmission, this superpower seems to have evolved as a survival-technique mechanism. “In the past, we thought of them making nutrients available from the [roots and soil], but now we see another evolutionary role for them in which they pay the plant back by transmitting the signal efficiently,” explained John Pickett of Rothamsted Research in the UK. Professor Pickett expressed his "abject surprise that it was just so powerful - just such a fantastic signalling system". In regards to benefiting farmers, the findings could be put to great use with many crops that suffer potential aphid damage. This can be accomplished by arranging for a particular, "sacrificial" plant to be kept at a distance from the rest of the crop -- so that when aphids do threaten, the fungi alarm system can provide advance notice allowing the farmers to take defensive action. And for those who think this fungi-crop paradigm is limited to the farming industry, Larry Hawes at Forbes sees the correlation as it relates to business at large. In this editorial titled, "Networks In Nature As Models For Business Networks," he urges companies to take heed as to how this model works and to consider operating similarly in their daily business dealings, particularly when there is a threat from outside the company. He poses the hypothesis that organizations can work together to defend their common interests when attacked by a competitor or an uncontrollable market force, similarly as plants do when threatened by aphids? So when dining on your next high-priced menu item that includes truffles as an ingredient, you might take a moment to appreciate how fungus benefits the world globally --- above and beyond tantalizing your taste buds!